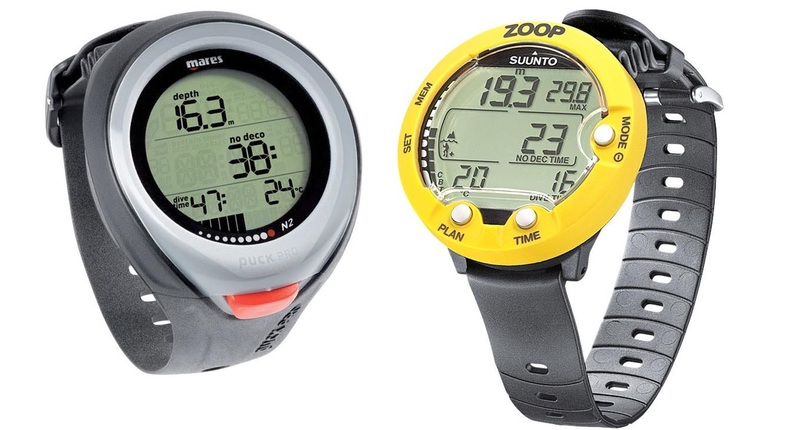 Mares Puck Pro and Suunto Zoop are examples of affordable dive computers. They are easy to use and provides all functions you need to dive safely. Aeris A300 CS and Oceanic OCI are examples of more advanced dive computers. They can either have a large, bright display or look like a sportswatch. Advanced features can be multiple gas mixes, compass and more. 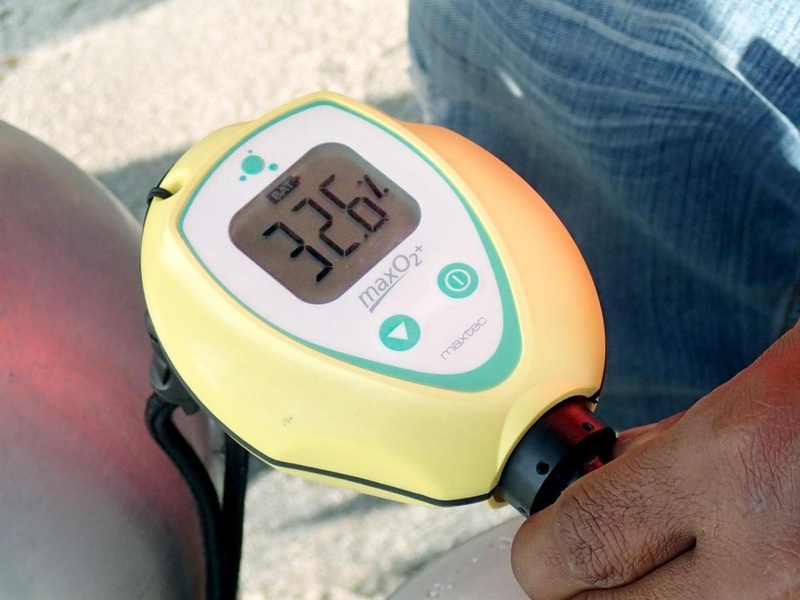 Almost every dive computer is programmed to use enriched air (Nitrox). Before the dive is the oxygen percentage of the air tank measured, and the value is inserted into the dive computer. A major concern divers is to avoid excessive accumulation of nitrogen in the body. If you stay too deep too long, you must make decompression stops on the way up. In the world of recreational diving is this an emergency procedure. Not long ago did most recreational divers use tables to compute how long they could stay at various depths. This required good planning and discipline. Today are dive computers widely used because they are easy to use and affordable. Prices start at USD 300). The dive computer shows you how deep you are and how many minutes you can stay at the current depth before your reach the decompression limit. It can be set for normal air or Nitrox (enriched air). You can also vary the safety margins to more conservative values, for example to compensate for age. A log function allows you to recall maximum depth, average depth, dive duration, minimum temperature and other data from your previous dives. All in all is it a valuable tool that makes scuba diving much safer. 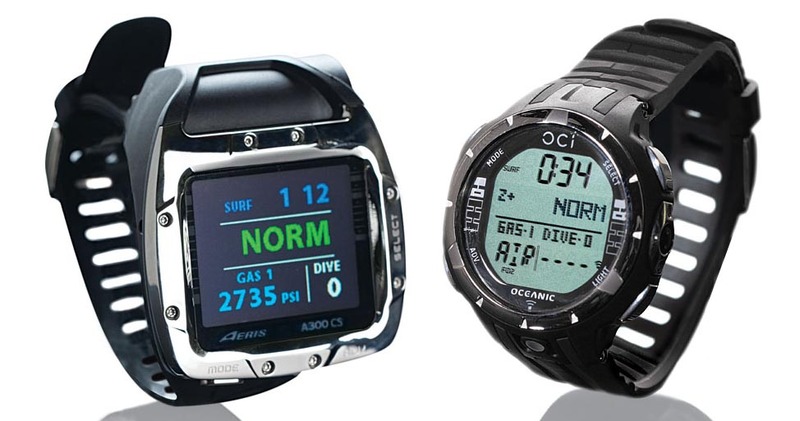 You must use the same dive computer for successive dives, because it keeps track of the remaining nitrogen concentration in your body when you start your next dive. You can either buy your own computer or rent it at the dive center (you will then use the same computer for all successive dives). The dive computer can also tell you when it is safe to fly. Commercial airliners cruise at altitudes where the air pressure is 1/3 of the air pressure at sea level. A sudden loss of cabin pressure may cause decompression sickness if you fly too early after a dive. Such incidents happens only a few times out of several millions of flights every year, but as divers shall we never take any chances. It is recommended to wait 24 hours before you fly after a dive. Advanced models have modes for dives with various gas types, but this is for professionals.